When these Overland Park homeowners called us, they had a nice outdoor area in their back yard but it wasn’t doing what they wanted it to. They had a nice pool they used extensively for grandchildren and family. They had small patio with no shade adjacent to the pool which was next to a gravel landscaping area that wasn’t very attractive. 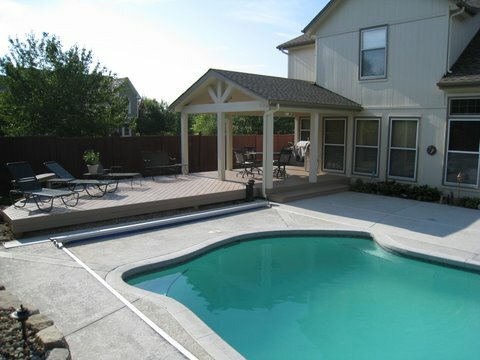 The outdoor living area had no sun protection so they wanted to have a partially shaded structure for those not swimming to enjoy the pool without as much sun. They didn’t want any screens on the porch, just an open view to enhance the ambiance of their outdoor living. They wanted the porch to match their house and look like an extension of their home. Thinking about the flow from the house to the covered porch, there are a couple of things that are important. One is to have the walk-out from the house at the level of the house. Someone carrying food could easily trip if there’s a big step up or down. 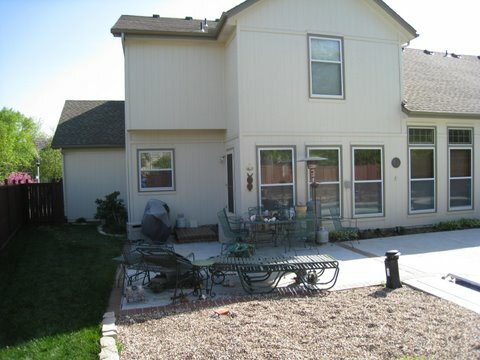 Another consideration is whether you want continuous shade or protection from the elements in that transition. To this end, we connected the open porch roof to the house so they can walk directly under the porch from the house. The patio is well finished. It has ceiling fans, lights, and even heaters attached to the painted beadboard ceiling. The owners wanted to add an extended outdoor living area with a view of the pool that did not include sun protection. So, continuing from the floor of the open porch is a low elevation deck. The deck and the attached bench are made of AZEK in the brownstone color. This light color also has a cooler surface. The deck is raised slightly so there is air flow under the deck to make the deck even cooler and easier on the feet on hot days. In the design process, our goal is to translate the goals of how you want to live into an area that meets each of those needs whether this includes a light decking color with ventilation for a cool surface temperature or a more elevated roof to a covered porch for a more open an airy feel. Share your outdoor living goals and desires with your contractor so they can truly come up with a custom solution that meets your needs and how you want to live. 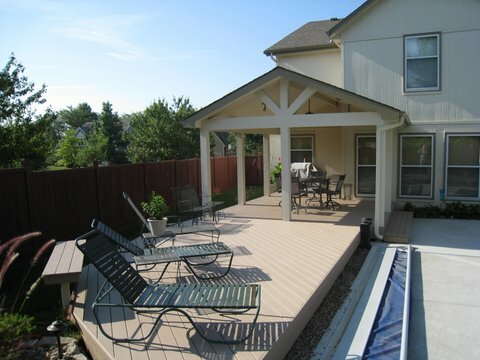 For a free consultation about creating an outdoor living area or area to compliment your home and outdoor living goals, give us a call (913) 851 – 3325, email us http://kansas-city.archadeck.com/ or visit our website to view more pictures and submit a request for a free consultation. This entry was posted in AZEK, Covered porch, Decks, low maintenance decks, Open porch, porches and tagged Archadeck of Kansas City, AZEK deck Archadeck Kansas City, AZEK deck Overland Park KS on November 28, 2011 by archadeckkansascity.